Let The UPS Store print your business menus and forms. Does your restaurant or cafe require menu printing services? Beautiful, high quality menus help showcase your dishes and promote your business to new customers. The UPS Store can help bring your menu ideas and designs to life. It’s not just restaurants that need custom menu printing. If your business uses menu formats as part of its marketing material, The UPS Store menu printing services can help highlight your products. The UPS Store can provide full-colour, laminated menus in various sizes. Different folding options are also available and we can print your menus on waterproof paper to improve durability and keep them looking new for longer. We also offer various types of custom form printing. If your business requires simple black and white single sheet forms or custom designed multi-part carbonless forms for invoices and receipts, The UPS Store printing services can help. Ensure your business looks even more professional by incorporating your company logo and information on a full-colour carbonless data form. Whether you need to produce a contract for new employees or print a service invoice form for existing customers, The UPS Store has a printing solution to suit your needs. Come in to your local The UPS Store to start planning your print run today! Or, enjoy the convenience of ordering and printing your business menus and forms online, with The UPS Store Online Printing. 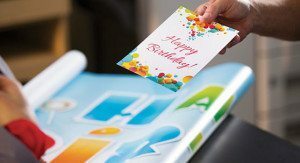 Some The UPS Store locations have an in-house graphic designer to assist with the design of your menus or forms and most stores offer online printing. Simply contact your nearest store to find out which menu and carbonless form printing services are available.